Robert B. Kaczmarek, age 61 of Kenosha, died on Thursday, April 4, 2019 at Brookside Care Center. Born in Milwaukee on August 30, 1957, he was the son of the late Florian and Geraldine (Bronkalla) Kaczmarek. He attended schools in Greenfield, WI and was a graduate of Greenfield High School. Bob continued this education earning a Bachelor of Business Science Degree in construction administration from the University of Wisconsin-Madison. He earned a Master Degree in business administration from the University of Wisconsin-Milwaukee. Bob earned the ASA Designation in Machinery and Equipment – Technical Valuations/Cost Surveys from the American Society of Appraisers and was a senior member of the organization. He was a member and past board president of the Wisconsin Alumni Association; Science and Agriculture Group and Kenosha Chapter. Bob met his true love, Victoria Sarnecki in Milwaukee. On September 28, 1985 at Blessed Sacrament Catholic Church, they were united in marriage. For nearly 33 years, they made Kenosha their home. Bob was employed with CLA-CliftonLarsonAllen, LLC. Previously, he was employed with Schenk, S.C. serving as their construction cost segregation leader. He had been a featured speaker on cost segregation practices for industry groups, tax organization, and state and national CPA societies including the AICPA National Real Estate Conference. 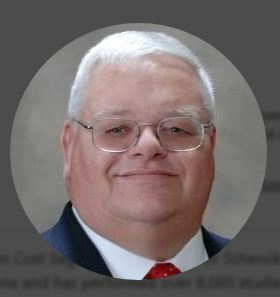 In addition, he served as past editor of the Journal of Technical Valuation and authored numerous articles for it, the Journal of Property Taxation and several trade publications in the food industry. For 44 years, he was a member of the Badger Boys State; an organization that teaches Wisconsin high school students leadership and workings of government. Bob held several positions with the Badger Boys program including City Counselor, County Counselor, Assistant Director and Program Director. He was Chairman of the Board and Finance Chairman with St. Joseph’s Catholic Academy. During the Christmas holiday, Bob enjoyed playing and dressing the part of Santa Claus for St. Joseph’s. Bob was also a Board Member of Kenosha Right to Life. Since 2005, he looked forward to planning events in Kenosha. He also looked forward to taking charge of the annual dinner in October. Bob’s faith was very important to him. He was a faithful member of St. Anthony of Padua Catholic Church and the St. Anthony’s Men’s Group. Previously, he was a member of St. Peter’s Eucharistic Ministry Board. Bob and his wife, Vicki opened their home to several International Students. With their help the students were able to get their education at St. Joseph Catholic Academy. Bob is survived by his loving wife, Victoria Kaczmarek; his daughter, Elizabeth Kaczmarek; Bob’s “International Girls”, Wren Lee, Paris Huang, Jennifer Lyn and Chelcy Wang; his sister, Susan Zielinski; his mother-in-law, Rita Sarnecki; and his brother-in-law and sister-in-law, Christopher and Julie Sarnecki. In addition to his parents, he was preceded in death by his father-in-law, Bill Sarnecki. The family would like to extend a special thank you to Beau and Diane Bosovich and Family; the staff at Brookside Care Center-6th Wing and Dr. Giuseppe Garretto for the compassionate care they provided.